Today sees the publication of the next four in the ongoing series of constituency polls on behalf of Alan Bown. 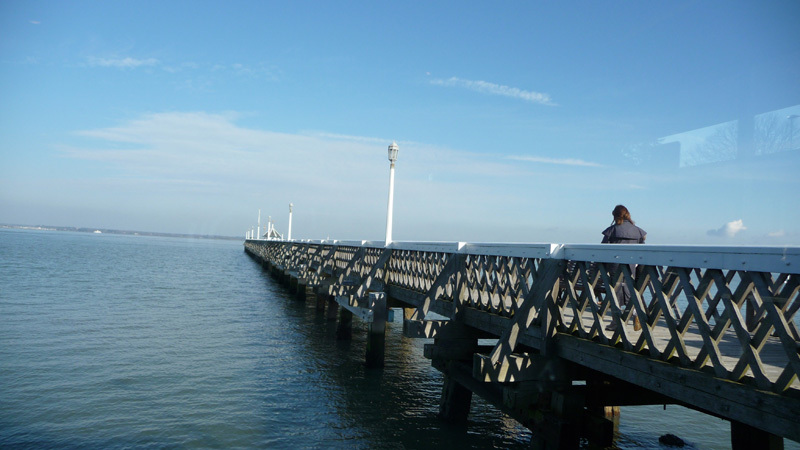 Today’s releases are Folkestone & Hythe, Bognor Regis & Littlehampton, Great Yarmouth and Crewe & Nantwich. Headline results are outlined below. 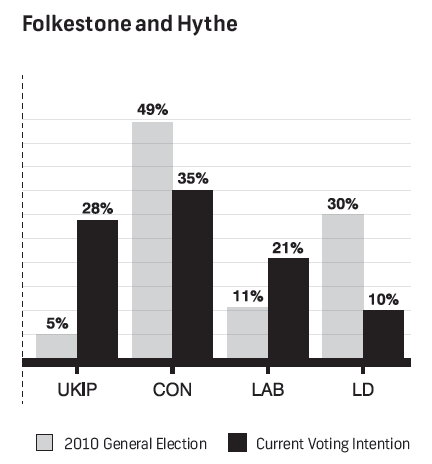 Folkestone & Hythe, previously considered a safe Conservative seat with a 19 point lead over the Liberal Democrats at the last election, now shows a significant drop in the vote shares for both coalition partners, with Labour and particularly UKIP as the main beneficiaries. UKIP have jumped from fourth place in 2010 to second place in the current voting intention, with the Conservative lead now forecast at only 7 points. Once this transformation in the state of the race becomes widely known to voters, the question is whether Labour and Lib Dem voters will side with UKIP for a chance to defeat Tory incumbents, or fall in behind the Conservatives to keep out the chance of a UKIP gain. 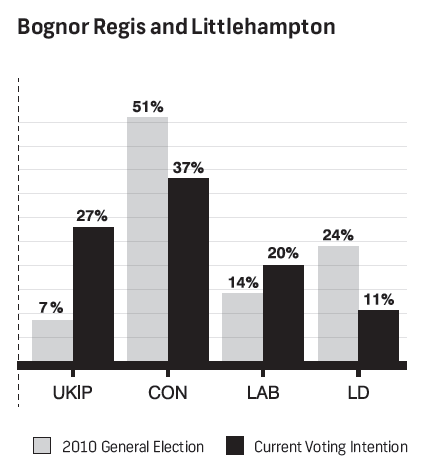 Bognor Regis & Littlehampton has traditionally been an even more secure seat for the Conservatives, with a 27 point majority in 2010. Whilst the swings shown here are not quite as large as those seen in Folkestone & Hythe, they still show a significant drop in Conservative and Liberal Democrats support here and a large boost for UKIP who have nearly quadrupled their already significant vote share of 7% in 2010. The gain for Labour here is relatively small at six points, suggesting they are perhaps struggling to make much headway in this affluent southern constituency. 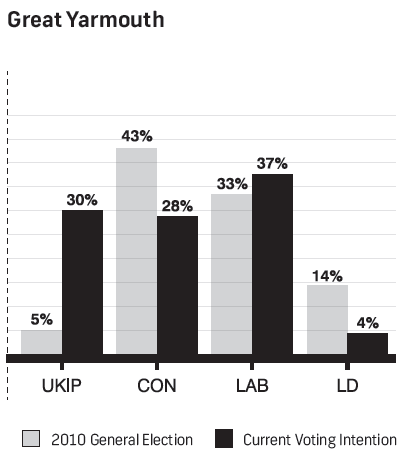 Great Yarmouth has been a key swing seat since the 1980s, which the Conservatives regained from Labour in 2010. Our polling shows that not only is Labour forecast to regain this seat in 2015, but the Conservatives are in danger of slipping from first to third place, behind UKIP who have surged from 5% to 30% – alongside South Thanet the highest figure we have polled them in out of the constituency polls published so far. Far from this being a result of UKIP simply depressing the Conservative vote, however, the poll shows UKIP taking almost as many votes from Labour as from the Conservatives here, with the result that the Conservatives would not be forecast to hold the seat even if all UKIP votes were reallocated by 2010 vote. 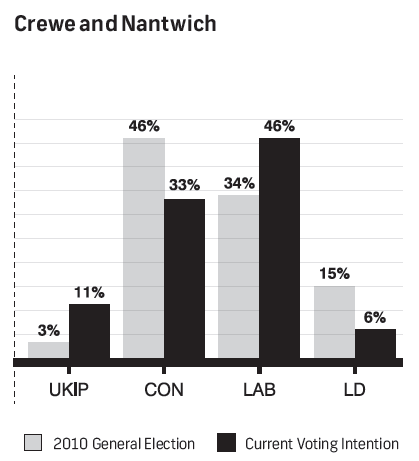 If only to further illustrate the point that UKIP’s impact on the Conservative – Labour race is not as significant as many have claimed, one need only compare the results in Great Yarmouth above with the poll results in another key marginal seat, Crewe & Nantwich. The 2010 results here were remarkably similar to Great Yarmouth (only 7 points difference across all political parties), but by contrast this is a seat in which UKIP is performing significantly less well, on only 11 points. But the lower UKIP vote share does not seem to have helped the Conservatives at all – in fact the Conservative to Labour swing shown here is three points higher than in Great Yarmouth. 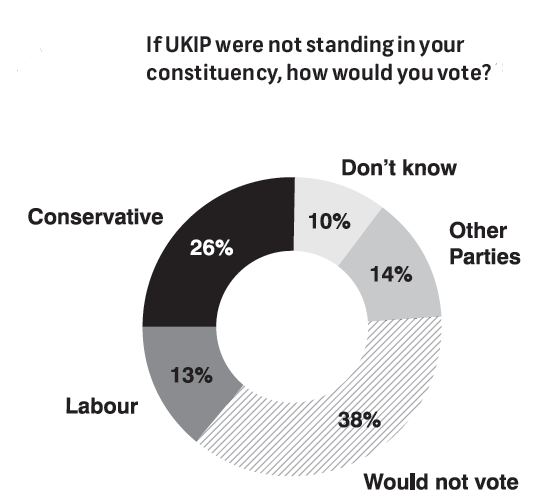 This question was asked to UKIP voters, and the aggregate results from the five polls where it was asked are shown in the chart to the left. 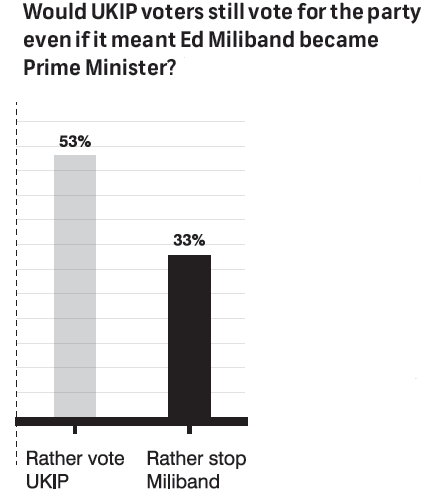 Most UKIP voters would prefer to stick with their UKIP vote even if this made Ed Miliband Prime Minister. Because this chart includes two ‘safe’ conservative seats (Bognor & Littlehampton and Folkestone & Hythe) as well as three ‘marginal’ seats (South Thanet, Great Yarmouth and Crewe & Nantwich), it understates the proportion of people who would prefer voting UKIP to stopping Miliband across just the marginals. In Great Yarmouth, for instance, the figures were 68% who would rather vote UKIP to 23% who would rather stop Ed Miliband. “Imagine for a moment that there was no UKIP candidate standing in your [Folkestone & Hythe] constituency. The results can be seen in the chart to the right. The net gain to the Conservatives over Labour if UKIP were removed from the equation can be seen to be 13% of the UKIP vote (or no more than 2 points nationally if UKIP is taken to be around 18%). In marginals again the picture is tighter, with the results in South Thanet for instance showing a net gain to the Conservatives of only 2% of the UKIP vote if UKIP were not standing – for a total gain of only 0.6% over Labour. The fact that the most popular response to this question was “would not vote” suggests that UKIP voters have developed their own sense of identity with the party and are no longer “in the market” for other political parties to try and win them over. The final question asked to UKIP voters in the four most recent polls was what their main motivation was in supporting the party. It has been regularly commented that UKIP voters are mainly protesting against established political parties. 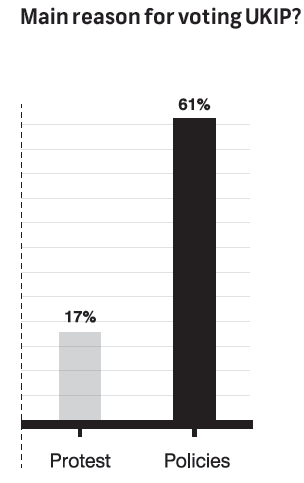 However, our research indicates that UKIP supporters cited “policy” as their primary motivation. At 61%, the proportion of UKIP voters citing “policy” as their main motivation was actually higher than for either Labour or Conservative voters, both of whom were quite likely instead to say that they had “always voted for that party” rather than that they were particularly attracted by anything in the parties’ current policy platforms.